This commonly asked question could be answered in many different ways. As a consumer you should ask yourself a few questions: Did I have more people staying at this property for the time period of the bill? The water readings and dates can be found on the back of your water bill. Are my faucets in my sinks or tubs dripping? Do I have to shake the handle on my toilet to make it stop running? All of the above questions are direct causes of higher water consumption, which in return will cause a higher bill to be sent to you. If water is shut off at a property, first you need to find out if your account has been turned over to the collection agency for the delinquent account balance. If this is the case please contact ARB at 610-455-4115. If you do not have a past due amount, call the Reading Area Water Authority office and we will call our Distribution Department and ask them if they know if anything unusual is going on at the location of the property. If you have received a notice on your door instructing the property to call for a meter change out, and this was not done, your water may be turned off. If none of the above applies, and the weather is cold, it could be that the pipes are frozen and we would then suggest you call a plumber. Please Note: If there is a Meter Reconnection fee that has not been paid and sent to Arcadia Recovery Bureau that could also be cause for turn off. My water is brown and water pressure is low – why? Call the Reading Area Water Authority Administration Office. Our staff will contact the Distribution Department with the property address and ask if there is a back flush going on or water main break. If either is going on in that area, this would be cause for dirty water or low pressure. If it is a Back Flush – it should clear up in 30 to 60 minutes. If it is a Main Break customer will be instructed as to how to handle the water usage by notice on the property front door. If it is not either of these 2 issues, we will ask the Distribution Department to go out and check the property, they will then let the customer know what is going on after inspection. The owner is the only address that we are legally obligated to forward the bill to. If the mailing address has changed recently, the Reading Area Water Authority needs to be notified of this change. If a bill is returned, the Reading Area Water Authority staff is able to note if the bills are being returned by the post office. If this is a newly purchased property RAWA will need a copy of the settlement papers from settlement showing the new owner. If none of these explanations pertain to you as the customer, then you can call into the Water Authority Administration office to have a balance sheet provided to you however, you would need to fill out a Right to Know form prior to obtaining the information. Can you send the bill to my tenant? The Water Authority can only send bills to the owner. The owner is the responsible person for the bill. Therefore it is the responsibility of the owner to make sure his/her tenants receive a copy or an amount to pay. If bills can not be provided to tenant in a timely manner the tenant can fill out the Right to Know form and mail, email or fax to the Reading Area Water Authority Administration Office. This process will need to be done each month. Can I get the water turned off at my property? If the property is vacant the owner may have the water service turned off at the curb stop. The owner must contact the Reading Area Water Authority Administration Office and receive an application for “Voluntary Water Shut Off”. This form must be filled out, notarized and returned to the Administration office along with a $112.00 turn on/turn off fee. The minimum service charge for the surcharges consisting of the water surcharge, meter surcharge, sewer surcharge and fire (if applicable) would continue to be billed to the owner. Owner may turn the water off at the meter in the property to avoid the water turn on/turn off fee. Please note that no one other than Water Authority Personnel can turn the water off at the curb stop. Violators can be prosecuted. There is water and sewer coming in my basement – why? Usually this is a Sewer issue and you should contact the sewer department of the City of Reading at 610-655-6008 or the Service Center 1-877-727-3234 and someone will be dispatched to your location. The cap outside for the water and sewer is missing what should I do? It is the owner’s responsibility to maintain the missing water or sewer caps located on your property. To replace, you will need to contact a supply company to purchase a new one. You will need to know which one you are looking for when you make your purchase. There are (2) two separate sewer boxes at the curb, one is vented and the other is not. Water and gas boxes are smaller in diameter than the sewer boxes. If you have a question regarding which cap is missing you may call the Reading Area Water Authority Distribution Department at 610-655-6254 to verify. Can I be put on a payment plan? Customers that are in need of additional time to pay a balance can call the Customer Service Department and review their balance with a CSR. A payment plan can be granted to customers with reasonable terms. For additional information and to see if you qualify to be placed on a payment plan please call the RAWA office at 610-406-6300. Why is my bill higher than my neighbors and they have X amount of people and I live alone? Customers cannot compare their bills to that of their neighbors. Each property uses water in different ways. Your water/sewer bill is based on the water consumption that is located on the back of your water/sewer bill. How do I get a final read? If the customer is selling their home and need a certification from our office the title company, lawyer and or/realtor that the customer is dealing with are the only persons whom can make this request by submitting a Certification Request. Requests can be made on line and paid for on line at Readingareawater.com. You may also mail, or drop off a request at our Business Office, 1801 Kutztown Road, Reading Pa 19604. The cost for this service is: Water/Sewer Certification – $35.00, Curbside Option #1 – $50.00, Curbside Option #2 – $25.00. Please make checks payable to Reading Area Water Authority. All certifications require a minimum of 10 business days for completion. Can you fax me a copy of my bill? By filling out a “Right to Know Form” the Reading Area Water Authority can then provide you a copy of a bill or account history. Can you tell me if we have a leak? With our new meters we are able to detect if there was consecutive usage at the property by the dates the excess consumption started and when the excess consumption ended. The new Master Meters have the ability to produce reports for us to share with the property owner to show them times and dates of continual usage. The Neptune Radio Devices (also known as an E-coder meter) have a report that the Water Authority can run each month at the request of a customer. Per your request, the Reading Area Water Authority Administration can locate the property address and read the report to see if there was consecutive usage at the property and when this started. The older Neptune meters that do not have a radio device attached, do not have either of these abilities and if the customer is encountering high usage the Water Authority Administration would send a technician to the property to replace the meter with an E-Coder (radio) device. Depending on the districts in question is the basis of which radio meter would be installed. I think my meter is broken and that is why I have high reads at my property. When meters start to age they run slower – the meters will never run fast and slow and fast again causing higher usage. The only way to have higher usage is to have water pulled thru the meter. How this occurs is by either more consumption or consecutive usage at the property which is causing the higher consumption. Meters are not connected to electricity, and only the dials move when water is passing through the meter area. Since I got the new meter my bills are so high. 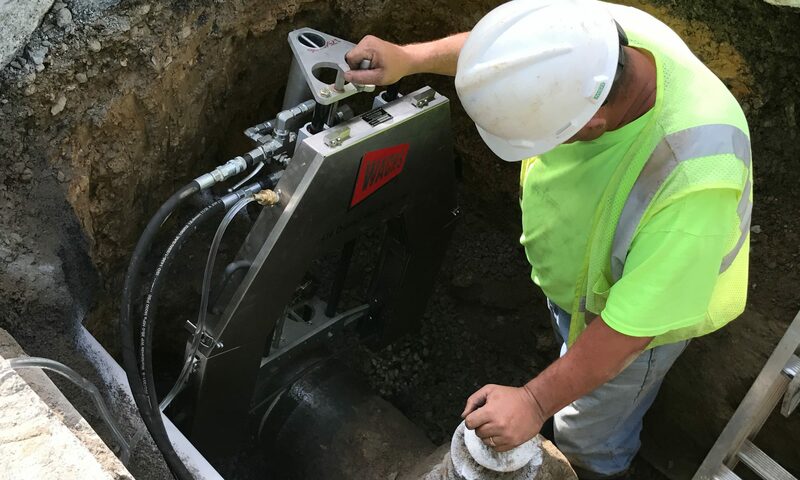 The meters that are being installed are more accurate than an older meter. Older meters tend to run slow. At the time of the change out a final meter reading is taken and the new meter start amount is recorded. Is there a charge for a new meter? There is no charge for a new meter to be installed at the property (for meters up to 1.5″, larger meters are owner responsibility) unless the old meter has been damaged or is missing. If this is the case, there is a $560 meter reconnection fee that is due. Why am I responsible for a damaged meter fine if I don’t live at this property? The home owner is responsible for the meter at the property. The Reading Area Water Authority does not bill tenants for damaged meters. To learn more about the consumer responsibility, click on the following link: Meter Reconnection Fee signed. Why am I paying for service at my property if the pipes and meter are missing and no one lives there? Unless the property’s water lines have been abandoned by the Reading Area Water Authority in the street, the abandonment fee has been paid and all delinquent balances are paid in full, you will continue to receive a bill for the service charges. As long as there are lines going to the property and it is available to have the service then the fee is due each month. My account is with the collection agency; can’t I make a payment arrangement with you? Once the customer has been sent to collections they must contact the collection agency directly at 610-378-5000. Reading Area Water Authority Administration will not make any payment arrangements or decisions on the balances once it has been turned over to their office. I paid the collection agency, why do I still have a balance? When an account has reached the 4th billing cycling and is still outstanding, the most delinquent bill will be turned over for collections. There will be 3 months of billings that will remain at RAWA. If the most delinquent amount is paid at collections, you must then pay on the 3 more recent balances that have not been turned over to collections. For further explanation please contact the RAWA office at 610-406-6300. Can my penalty be waived? As a one time courtesy our office may waive a penalty to a customer in good standing. Customers cannot be past due on their previous month’s bills or in collections. This is determined on a bill to bill basis. Why did I get a penalty on my bill? All payments are due on the last day of each month. A 10% penalty is added after the bill has reached 60 days and is still unpaid. There is no grace period. Can I have a payment plan on the Meter Reconnection Fee? There is no payment arrangements made for this type of bill. The owner has 60 days from the first letter to pay the bill in full. After 61 days the balance that is remaining on the bill is sent to the collection agency and a 15% fee is added, along with the risk of the water being turned off. Why is my bill being estimated? There could be many different reasons that the bill is being estimated. The first thing you would want to do is determine if you are being estimated by turning your bill over and looking on the back of the bill and see if the reading is being estimated. It is possible that the meter’s electronic signal or the out side black box is not properly picking up the meter read from inside the home. At this point we would ask the owner to call the Reading Area Water Authority office with a good time and date that we would come out and inspect the meter and get an actual read. Please note that the meter readers can not determine if the reading is estimated or actual by receiving the meter readings. This is not done until the devices used to obtain the meter readings are loaded into the computer system. Can you send someone out to my property to look for a leak? The Reading Area Water Authority does not check properties for leaks. It is the responsibility of the home owner to call a licensed plumber in the City of Reading to check for leaks. The sewer portion of the bill is calculated by the actual consumption of the water at the property. Any questions about pricing or amounts owed for the sewer should be directed to the sewer department at the City of Reading Citizens Services Center at 1-877-727-3234.